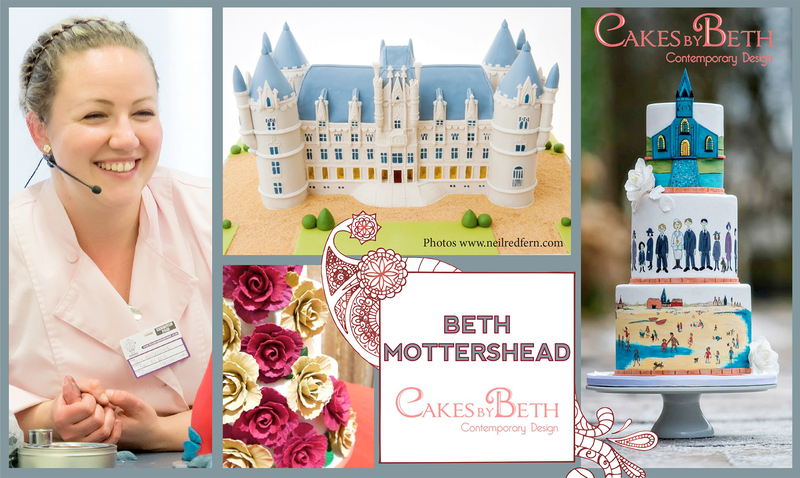 Beth Mottershead of Cakes by Beth (that’s Dr Beth Mottershead!) was recently mentioned on Weddzilla in a list of 20 of the most incredible wedding cake makers in the UK, in the same list as Peggy Porschen (and our Tracey Rothwell!). Her work is seriously top quality and very, very stylish. She recently made a cake for Paul Weller. She’s a very clever and thoroughly lovely chap! Hiya Beth! Tell us about yourself. I’m an art-loving science geek. It was during my time as a scientific researcher for my PhD that I really started cake decorating and it just took over from there. I was actually working as a researcher for a university when I decided to quit my job to focus on cakes full time. I’ve been in business for just over three years now and have never looked back. I’ve always loved baking and remember making marzipan frogs and lily pads for my dad’s birthday cake when I was about 14, but it was only when I reached about 24 that I tackled anything structural. I am completely self taught so I used to try things, analyse how I could improve on them, research different methods that others use and then create my own revised processes. I like it this way though as it means you get to create your own style and put your own stamp on things. The most challenging thing about my job is that as a one man band, I have to operate all aspects of my business, from answering enquiries to designing cakes, meeting couples for consultations, marketing, research, admin, book-keeping … and that’s all before I have cracked an egg or rolled out any icing. I have a part time assistant who will be helping me with the office side of things in about a month’s time, and I have put the wheels in motion to move into commercial premises. It’s great having a home studio but for me, the time is right to take the next step. You are well known for your elegant and stylish tiered wedding cakes. What did you think when you were first approached to create something for a jungle? Were you out of your comfort zone or did you relish it? I loved the jungle theme! I particularly loved the challenge of choosing items and styling them so that they were as native to India as possible. It meant that although there was a huge variety of exhibits, they all fitted together really well. It was a huge honour to be asked to be a part of such an amazing project. 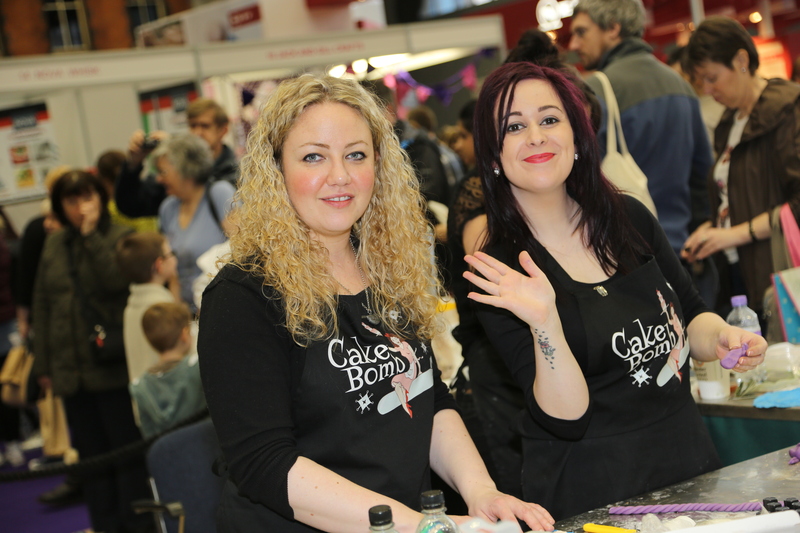 I felt that the whole CakeBomb collaboration was something a little bit different and to create a walk-in installation at The Cake & Bake Show sounded amazing! I have made structural cakes before and even one that lit up so I had some experience to help me get started but making a working hookah pipe cake was a slightly daunting task. I love a challenge though and always like to push myself so I couldn’t wait to get started! How on earth did you do that? It was one huge research project, reading into all sorts of options before I found the right one. It was one of those problems where every option is completely wrong until it is exactly right. I looked at air fresheners, incense sticks, smoke machines and all sorts. Finding something that wasn’t a fire hazard, wouldn’t squirt anything in anyone’s face, wouldn’t dissolve everyone else’s work and both looked smoky and smelled nice was a tough list of rules to abide by. It was only when I stumbled upon model railways and the life-like smoking funnel set ups you can get that I finally found the solution! I can see the scientist coming through. How long do you think it took you to make? I think it was just over a week of continuous work but this was spread out over a few weeks as things had to be left to dry and set. It took me a day just to get the basic internal support in place ready for the mechanism. You made flowers and leaves too – what kinds were they? What did you make them from? I mainly made leaves, which were my version of rock fig leaves (serrated edges in a deep green..and a hint of frosty sparkle) and star fruit fronds (multi-leaved branches with lots of yellow and brighter green). I also created some Pankusum flowers, which I chose a peachy orange colour for. The leaves were all rice paper, hand cut into shape and airbrushed, painted and dusted. The flowers were made from flower paste. 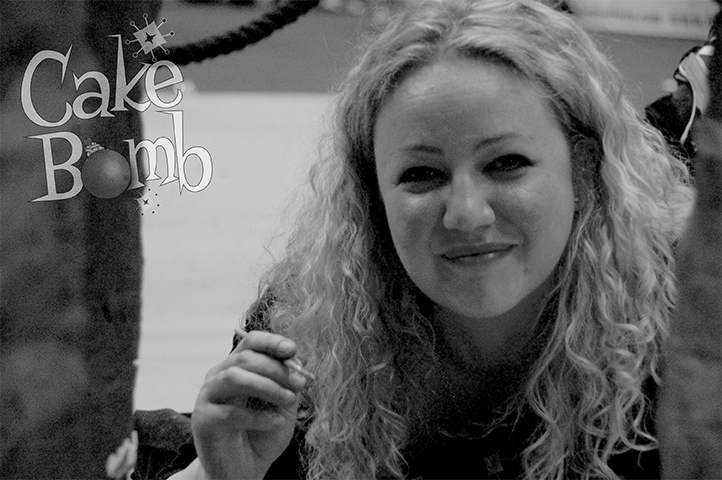 Your work didn’t stop each day when the show ended – you were up late making Cake Lace to decorate the elephant weren’t you? I know late nights are not a new experience for you, but is Cake Lace? Yes, being quite local to the show, I was ideally placed to make a few extra items that we needed. 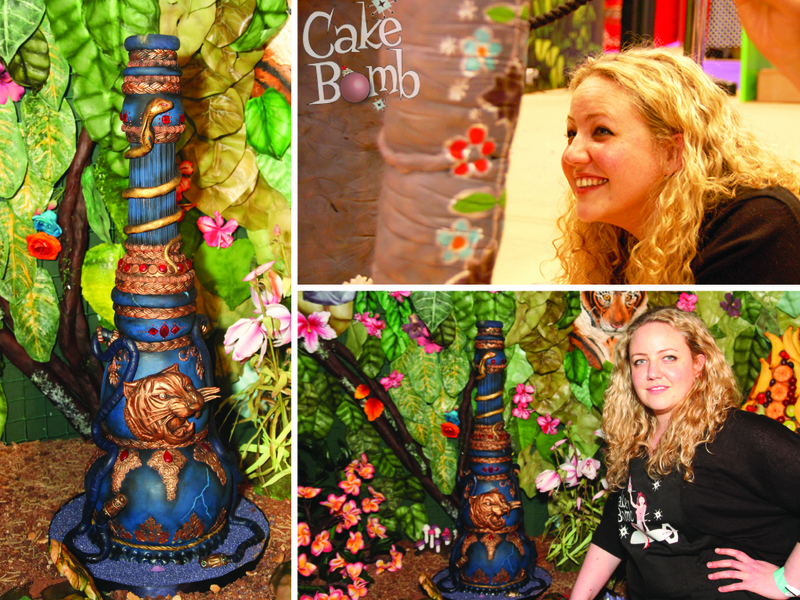 Even with the best of planning (and boy, was CakeBomb’s jungle well planned! ), you never fully know that you have everything you need until it is all in one place so I made some extra leaves and some edible lace for the elephant. Late nights are definitely not a new thing for me, and I’m sure most people who work for themselves will know exactly what I mean. Cake Lace is something I have used before and have experimented with some different ways of incorporating it into designs. One of my most recent wedding cakes, and the tallest of my career so far, featured gold Cake Lace as one of the key details so I’m a dab hand at using it. What was the most challenging thing about your involvement with Welcome to the Jungle in general? I have to say, the most challenging part was balancing working on the jungle with running my business. Such a large installation with so many amazing cake artists means there’s no room for rushing or producing second rate work, but couples have chosen me to make the most important cake of their life so they need to be looked after too. The enquiries don’t stop and I had orders to fulfil alongside making the hookah pipe and leaves so it really was a busy, busy time. Knowing what you know now, would you approach it any differently? I think with anything, once you’ve done something, you’ll be much faster doing it the second time around. I used a few different approaches to adding the cake element to the pipe and now I know that the answer is always “More ganache!” The visitors who came to see us all really appreciated the animals so I would like to create something furry as well. Of the others’ work – what was your favourite item and why? This is a really tough one as everyone’s work was amazing…but I think Annabel’s gharial wins it for me. His skin was amazing and the eye…you just had to see it to believe it. There are so many great cake artists out there, it’s difficult to pick out just one whose work I love. The sharp edges and clean finish of Australian work is the holy grail of wedding cake design and that is how I try to style my own work. I think I more have business idols, people who are truly passionate about their work, highly skilled in what they do, and can turn this into a successful, sustainable business. What is the favourite cake you’ve ever made? It’s tough to choose because I try to make my latest work my best work and keep pushing myself to create better and better cakes. 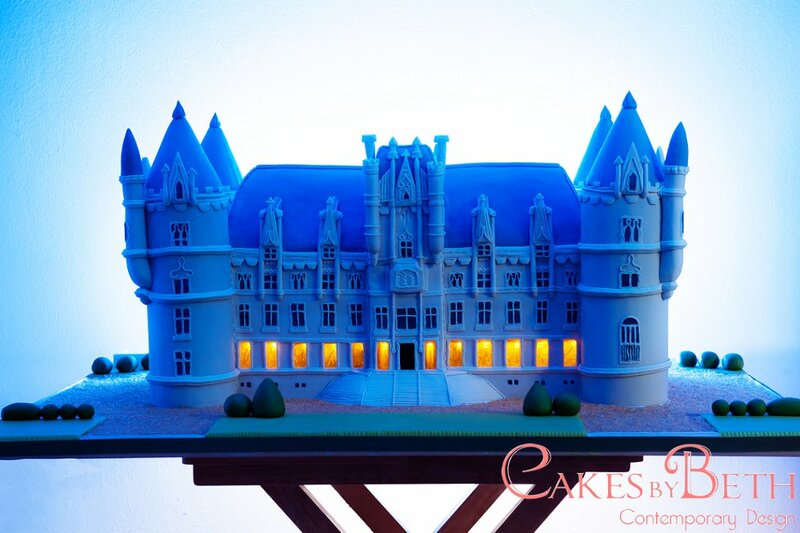 It takes a lot to beat the chateau cake that I created for a wedding in France. It was a replica of the actual chateau that the couple were marrying in and was definitely a life-changing event. I once designed a cake with a large metallic bird on the side and couples have really latched onto this idea so I am over the moon when I get to make a giant bird cake. It’s so quirky and unusual, but I think wedding cakes should be a really memorable part of a couple’s wedding day. I am a huge Breaking Bad fan so it also made my year when I had free reign on a Breaking Bad birthday cake design. So much fun! It’s officially wedding season so I have lots of wedding cakes to create for lovely couples this summer! At the end of 2013, I was declared the winner of The Balvenie Masters of Craft Award for food and drink, sponsored by Waitrose, so as part of my prize I have a large cake commission for them. This will be for the Autumn, when they launch a new whisky at their distillery in Scotland and I’m really excited about it!